2011 red bay filly. Outstanding show quality, action, and confirmation with wonderful disposition. She is always a sweetheart! The sire and dam of this filly are both in the Carson Sale. All three are as good as it gets! Lucy is a very powerful 2005 bay roan mare and dam of Cypress Creek Lucas' Lulu. She is an exceptionally good mover, easy keeper with beautiful confirmation and quality. Lucy is a great hitch mare prospect and proven broodmare for any breeding operation. This 2003 mare is a beautiful 18+ hand bay with four whites and a perfect blaze. Annimay has a tremendous foot and clean, sweet hocks. She is very impressive and has been started in harness. Annimay is a proven producer of championship titles. She is the dam of Cypress Creek Annimay's Amaretta, who has been named Supreme Champion at multiple Canadian shows. Born in 1998, is a proven brood mare and "easy keeper" with lots of feather. Hazel is a consistant producer year after year. Her last filly, Cypress Creek Rex's Handee Randee, is a special gal. This 2005 mare is a red bay with four white legs. Katie has the confirmation including outstanding hocks that allow her to be an unbelievable mover. She is balanced and displays an attitude of a winner. 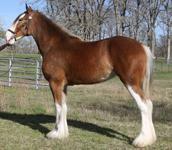 She is a full sister to the All Canadian Cart Mare, Kelly, owned by Willow Way Clydesdales. Katie is a fantastic broodmare and mother. Katie's 2010 colt, sired by our 2S Maxton Prince Charles, seems to have combined the long neck of his sire and the bold movement of his dam, that is accentuated by his fine silken feathers, mane, and tail. Katie's 2011 foal was a flashy filly, Cypress Creek Prince's Fanci Pants. Georgeous, picture perfect, 2009 dark bay top notch mare with excellent confirmation, lots of feathers, terrific movement, up headed, and great disposition. This mare would match as a team with Great American Maime Eisenhower. This 2007 bay mare is up-headed, pretty moving mare and has an outstanding pedigree. She could take you to the winner's circle, as well as be a foundation brood mare. She is an excellent candidate to be a cart winner or hitch mare. This 2006 bay mare was successfully shown in halter as a weanling and yearling and has great potential of being a show and brood mare. Her attitiude and heart are evident as she continually strives to please you. This mare is a product of the high quality of Maplewood's breeding program. Beautiful, 2008 dark bay (almost black) with four whites and white splash on left side only. Wonderful disposition with lots of action. This mare has excellent confirmation and is a very intelligent and flashy athlete. Gerri would be a perfect addition to any hitch or breeding program. This 2004 bay roan mare with four whites is an exceptional mover and has lots of class. She has proven to be a valued additon as a brood mare and shows great potential as a cart horse or would team up perfectly with Sassie. This mare has matured into a well developed, well rounded favorite at the farm. Her filly, by our Pinnacle's Aiden, is nothing short of a show stopper, Cypress Creek Pistol Packin' Mama. Both the mare and filly are athletic, yet elegant; their motion is natural, high stepping, and effortless. 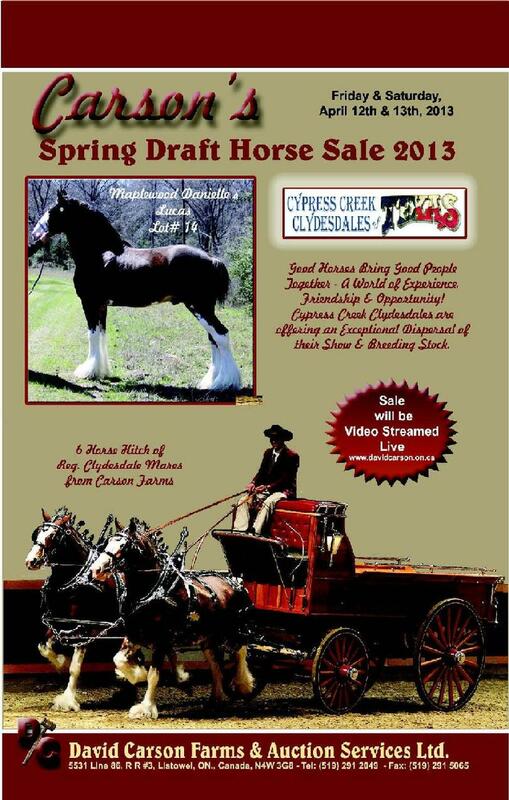 Pixie had another great filly 2011, Cypress Creek Aiden's Platinum Label. Sassie is a 2004 grand daughter of Tank. This powerful and drafty mare has excellent movement, beautiful silky feathers, sweet hocks, a wondereful disposition and lots of class. Sassie and Pixie would make a beautiful team. 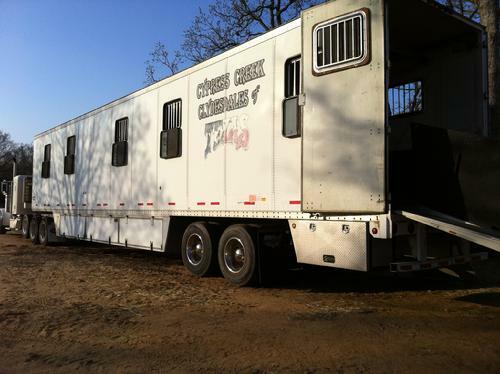 This 2008 mare has athletic ability, confirmation, quality and power all in one package. Cloie is a full sister to the All Canadian Cart Mare, Kelly, owned by Willow Way Clydesdeales. Snowball is a 2007, loudly marked, bay roan mare with 'athlete' written all over her. Her movement is clean, forward and powerful, driven by a beautifully built hindquarters. 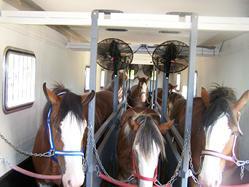 As a Junior Foal, she was 3rd at the 2007 World Clydesdale Show, which only begins to describe her potential as a line or chart horse. With luxurious feathering and a wonderful disposition, this mare would also make a perfect addition to any broodmare band, adding strength and endurance to your breeding program. FOR SALE AT CARSON'S...53' Wabash, duraplate, air ride suspension horse van accomodates 15 drafts or 9 drafts and show wagon. 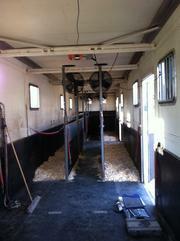 There is lots of room in 8x24 belly boxes and size of stalls adjustable. The 10 large drop down windows, 10 scoops, and generator providing power to fans are designed to supply ventilation for any situation. A side tie rail on one side is handy for small shows without stalls. Electric winch raises and lowers rear 16' aluminum ramp and/or harness boxes. A full length cocoa mat provides safe and easy loading every time. 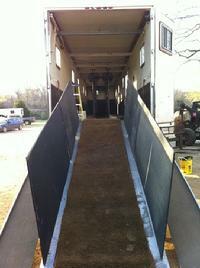 A second side ramp is easily accessable....THIS IS THE ONLY WAY TO LOAD UP AND GO TO SHOWS! A PHENOMINAL GROUP OF TOP QUALITY BREEDING ANIMALS REPRESENTING OUTSTANDING PEDIGREES IN THE INDUSTRY.